It's quite hot and muggy here (high today is 99, with the heat index about 5 degrees above that due to humidity). I'm enjoying the heat, since I run chilly. But seeing all of your fall capsules has me really itching to try on my fall clothes (and purge!). But trying on a sweater just doesn't work at the moment. 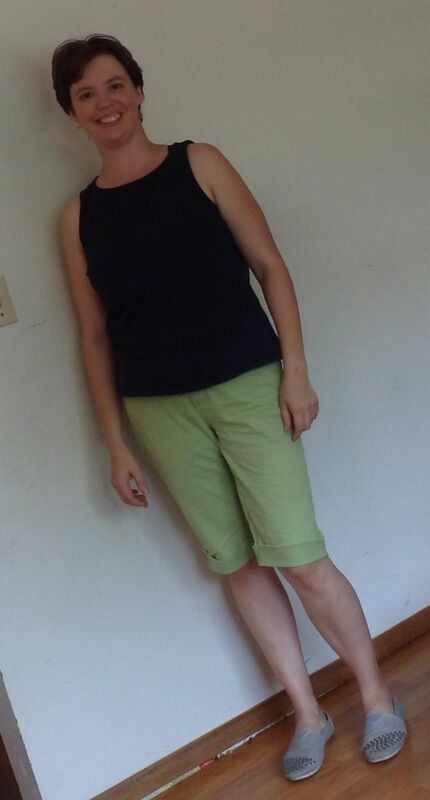 Due to the heat, I'm wearing more skirts, but trying to keep a bit of "tomboy" anyway. Does it work? #1-3 Volume-over-volume worn to church. Toughened up with boots. This is my first time trying skirt with boots - does it work? It worked for the frigid A/C at church. #4-5 Worn to play at the park with my kids when it was a "cool" 93 out on Saturday. 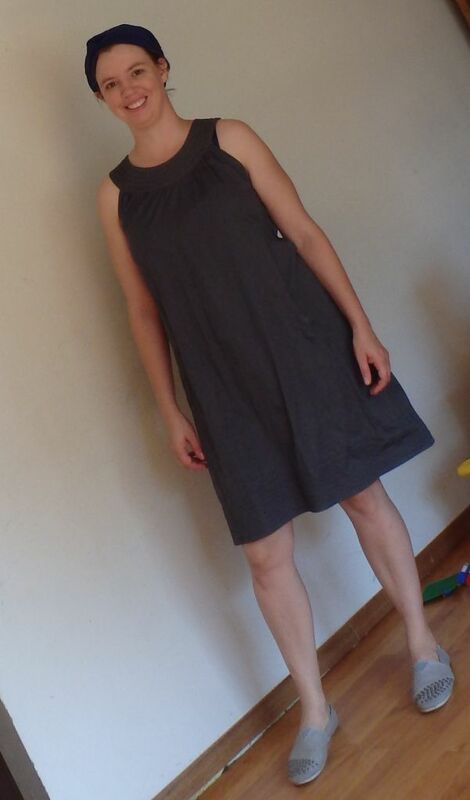 #6 worn yesterday - it was nice and warm - just a simple gray cotton sack dress. #7 wearing now. 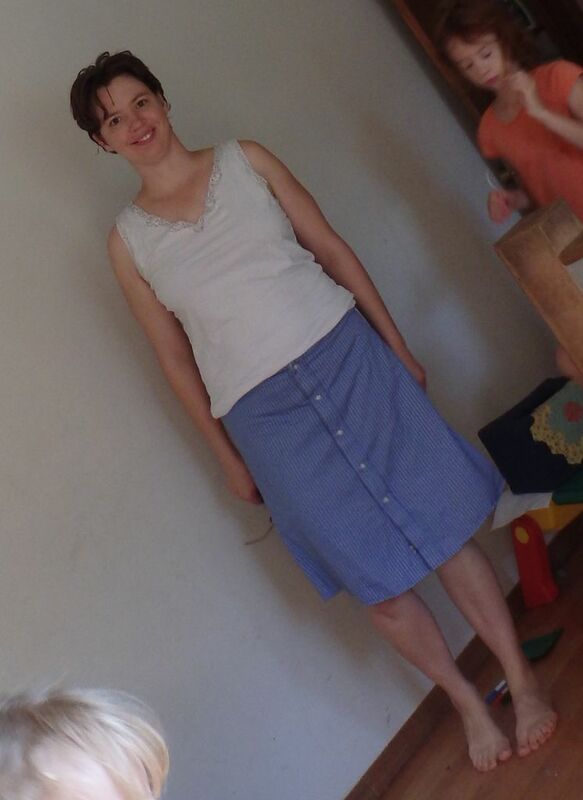 (Yes, I'm barefoot) The skirt made from a men's dress shirt with a white tank. I'm hoping to replace this tank with a white non-lacy tee or tank of the same length. (Ideally a bit more drapey). What are your suggestions? Do these work? As a side note, I really need to figure out something to do with my hair. Oh I LOVE your first outfit. It is very awesome. How does it look with your black moto boots? Love the sack dress too! I love that you kept you tomboy part with the boots. A great uniform you could duplicate. I think you're looking very Adorable Tomboy in addition to Happy! I like #1 but the top seems like it would bug me - do you mind the way the neckline is so drapey? (I'm wondering about bra strap issues). And what a great rework on the man's shirt in #7 - that is really fun and it looks great too. I really enjoy the fit of 6 on you. Glad you are getting some wear from #6. #1 is fun! Definitely a hint of tomboy there with the boots. I particularly like #1 here. It is perhaps not conventionally flattering but I find it interesting an attractive. I adore that top :) Have you conisidered trying the topper with a slimline pencil skirt as a dressy alternative? Deborah - a slim pencil skirt is a definite hole in my wardrobe! I've never found one that fits (they always seem to be made for people with a waist). I should really just sew one. I love the boots with that first skirt. Great look on you. I also really like the sack dress with the flats. Fun skirt from a shirt, too! And you look terrific in those long bermudas. Good job of dressing in the heat! I love the skirt & boots in the first picture. I am interested in your shirt-turned-skirt. I made a skirt in similar fabric and then regretted that I had done so, as it was so thin it didn't have enough structure. How is yours? Anne - it's fine - but I chose a really heavy-weight high quality men's shirt to use. I do think the weight of the fabric has to be heavy enough for a "top" to become a "bottom". In fabric stores, I see fabric separated this way - "bottom weights" are definitely heavier. I had that in mind when I decided to cut up the shirt, and I suspect that's why it worked pretty well. It does wrinkle like anything though. I love your casual outfit in #4-5 - that bag looks fantastic with the outfit. And I adore your dress in #6 - it's the perfect summer dress. I love the skirt in your first outfit but I'm a little unsure of the top with it - but I am not good with volume on volume so take that with a grain of salt.